From the very beginning you'd already see just how perfect Davy is. She's beautiful, she's a music prodigy set to attend Julliard, she has the perfect boyfriend every girl in their private school is drooling over, and her family loves her dearly. But all that came to and end when she tested for positive for Homicidal Tendency Syndrome a.k.a. the kill gene. She gets expelled from her school (they call it getting "uninvited" ha! Like that makes it sound any less depressing), her friends and her boyfriend frame her, her family doesn't know what to do with her or how to act around her... basically her perfect life falls apart. So... Uninvited. I swear I would've liked this more if the world-building was given more attention to than the romance which, in my opinion, wasn't all that good either. The whole time I was reading, I was waiting for any sort of history behind HTS. That's great and all but I was looking for more background. When did they start testing? What triggered the mandatory testing? Are other countries doing the same? Canada and Mexico were mentioned briefly but it was only to say that they don't want anybody from the United States crossing their borders. So it would seem that only the US is having trouble with HTS. That only makes me question the world-building more. It was hard for me to buy into the entire plot because the foundation wasn't that good. Then there's the romance. Davy and Sean's relationship wasn't that believable for me. Again, another thing that lacks solid foundation. I didn't really see why they should be with each other. Davy was kind of insta-obsessed with Sean at first because he's the gorgeous bad boy. Her descriptions of Sean were a bit overkill if you ask me. The more Davy reached out to Sean, the more he pushed her away and told her to not to trust anyone, even him. Then Davy gets into all sorts of trouble and surprise, surprise, Sean is always there to protect her. Next thing you know, they're getting hot and heavy in a training camp room. While they weren't exactly in love, their attraction was just as intense. It seems that the fact that they're both carriers is the only thing that binds them together. I probably wouldn't have a problem with the romance if it wasn't given so much importance. And Davy. I know she's supposed to be smart but there were just too many instances where she didn't act like it. It could be a way to make her appear innocent and harmless but I think it as overdone. Rants aside, I did like that Uninvited tries to explore nature vs. nurture and what makes people who they are. It was disgusting how carriers, especially innocent ones like Davy, were treated. I seriously wanted to strangle every non-carrier who were horrible to Davy. They were all being a bunch of hypocrites! So yeah, I may have not liked the story much but at least I felt the right emotions at the appropriate times. 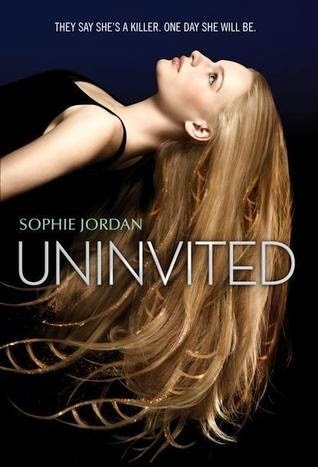 Uninvited gets 2 stars from me. Enjoyable but not enough for me to like it.